I love wallpaper! All who know me well knows that is a fact. 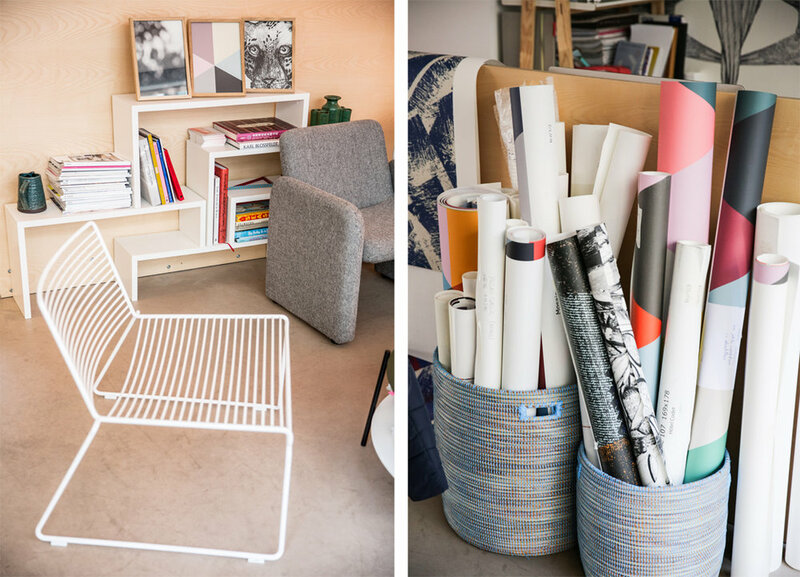 That's why I'd like to tell you about my little visit to French wallpaper atelier ("well made" in French) in Paris recently. It was such a nice time spent chatting one-on-one with owner and founder, Cécile Figuette, while my assistant, Toni Vinther, chatted with her partner Nicolas. Together, we learned so much about their special process in creating over-scale patterned wallpaper made to order. This means that it is 100% bespoke if you need it to be. Some elements of the pattern can move around according to the wishes of the homeowner or designer. For instance, if you want a bed in a certain place in a room, you can ask Cécile to create the paper so that the pattern fits around the bed... Maybe you want a tree a little to the left or right so that it can be viewed clearly on one side of the bed versus hidden behind the headboard. Now that's amazing service right there. I love the idea! Cécile designs nearly all of the patterns herself, and whenever they are printed (she prints everything locally at the moment) she goes to personally check to see that everything is up to spec. This lady is so inspiring to me because she is not only a remarkable business woman with a great head on her shoulders for running a wallpaper firm, but she is a creative, artistic soul who loves to do work that speaks to her heart. And she's a mom!!! That's even more impressive to me now when I meet women with kids than it was before I became a mom. Cécile clearly has a genuine passion for interiors, in fact I'll share some photos from her home at the bottom of this post so you can see what I mean. But first, a few photos that Toni and took in her 70 sq meter studio located in Village Saint Paul that opens onto the street and boasts a sunny courtyard. By the way... In the photo above, you can see the wildly popular pattern that my friend has in her son out in LA. This is a Bien Fait wallpaper that Emily had ordered and shipped all the way to California because she loved it so much. Whenever I see this pattern, I immediately think of Emily and sweet little Charlie! 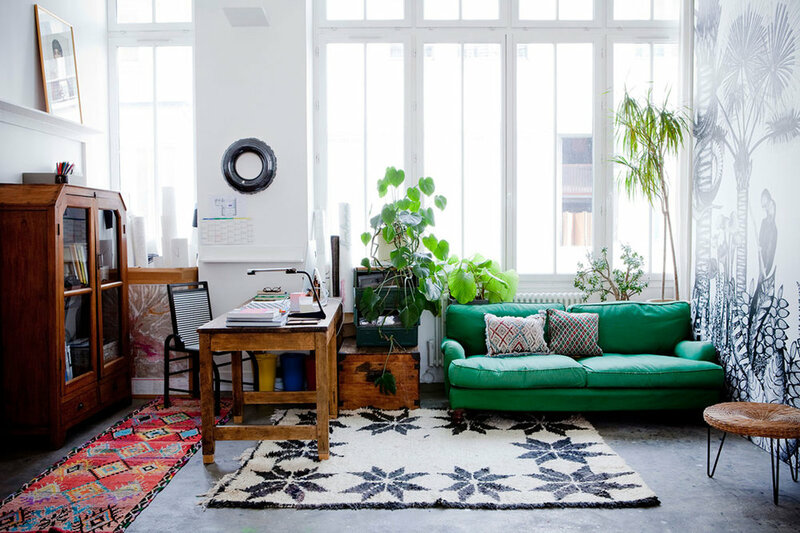 This over-scale geometric pattern shown in their studio above is one of their bestsellers and is called . It's also available in either a stronger or a more muted colorway -- in and versions. Soft is definitely my favorite of the three, though. This is one of my favorite patterns by Bien Fait, it's called . I love how bold it is! Cécile and her team are directly inspired by, "Scandinavian and Japanese culture, travel, ethnic and folk culture and graphic design," which was apparent to us the moment we stepped in to their studio but even more, once they presented the entire collection to us on a large wall I could see their inspirations even more. I loved how they are set up to show their papers, you can see above... There are these multiple pull-down electric panels that rise and lower with the click of a remote. In the image above, you can see the pattern on the wall in black and white and in green on the panel. Nicolas told us that they present their papers this way because they are so large-scale that it's the only way clients can really view them to get a sense of scale. The black "Typologie" mural is by ceramist . 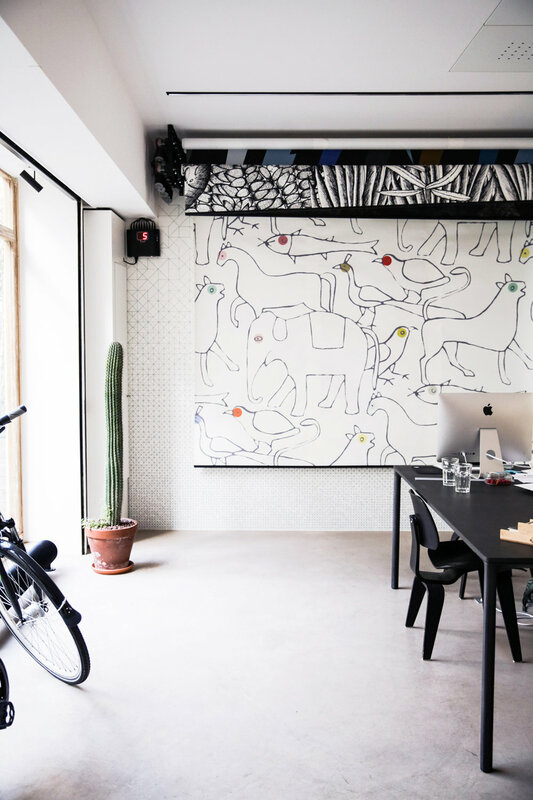 It is shown on Bien Fait's wallpaper in their little lounge area. As mentioned, Cécile is also a mom like me and so she has kids at home and all the fun (!) that goes with maintaining a stylish, creative home while also one where children can live and roam freely. I'm still learning the balance when it comes to this but French parents seem to have the knack hard-wired into their DNA. 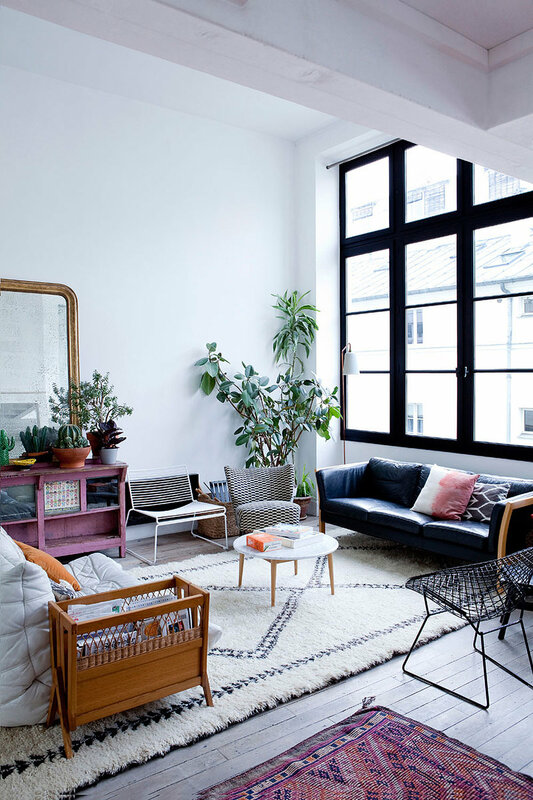 Parisian parents seem to always have the most stylish living spaces. 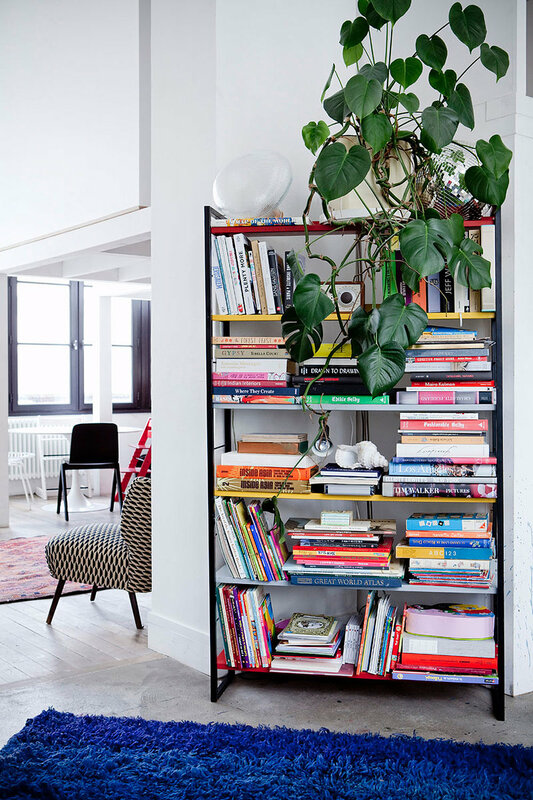 Now are you ready to see Cécile's beautiful family home in Paris? It's jaw-dropping, colorful, well curated and just amazing in every way. I cannot stop looking at it to be honest, it's lovely. 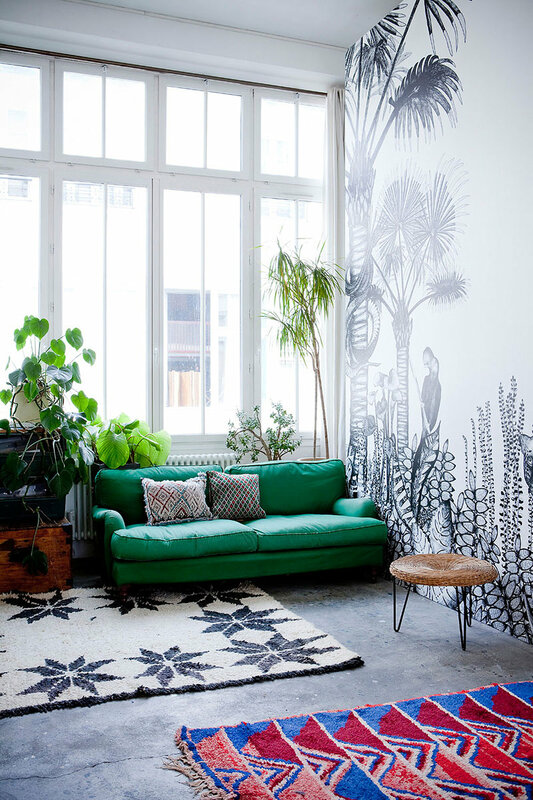 I like seeing how she incorporated her own wallpaper patterns throughout in small doses and I really love the black and white animal print on the wall in her living room next to that lush green velvet sofa. 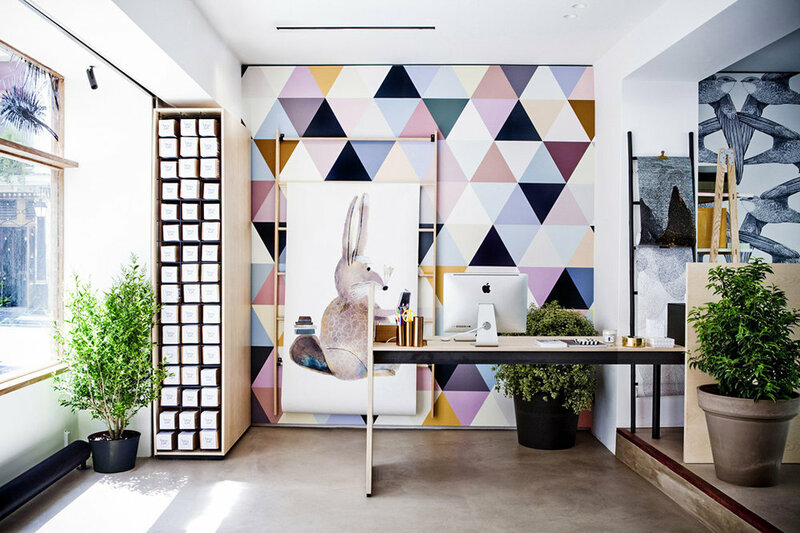 Try to see if you can spot the many wallpapers as you look at these photos below taken by photogapher for found via the beautiful blog. First, that's Cécile in her home shown top right. There isn't much about this home I don't love. It's inspiring to me because it feels very lived in and loving but also so chic and graphic, interesting, and of course, so very French - at least in my opinion as an American. I love her clever mix of vintage pottery, mid century furniture, Berber rugs, artwork... It's all so fantastic. What a pleasure to meet and mingle with Cécile in Paris, I'm so thankful that I got an intimate glimpse into her creative world and hope to be back in Paris soon again to meet more inspiring and imaginative people who are getting some great work done! Thank you Bien Fait for welcoming us to your studio, hope to visit again very soon!